I have been camping and painting for almost six weeks. It has been very hot but also quite productive for me. We were camping in various parks from Killbear near Owen Sound all the way across to Neys Provincial Park near Marathon (almost to Thunder Bay) Many of the group of seven painted extensively in this area so I researched some locations before I went and tried to find them. My favourite was near Wawa. A Y Jackson had a cabin on a Lake Superior beach just south of the town. One of his paintings called Shoreline Wawa Lake Superior was painted in 1955 in a small cove just north of this beach. I had to scramble over some rocks to get to it but I found the cove. It was a huge thrill for me to be standing painting almost exactly where he stood to paint his. I think my painting shows how inspired I was. I am not sure what the temperature reached yesterday but it was above 30C. That is way too hot for May especially considering how cool it has been the last while. I stood in the heat fighting with acrylic paint that was drying incredibly quickly and tried to focus on what I was doing. I was in a lets just get this done mood and maybe that was a good thing. I have tried painting the Mcquesten bridge many times and failed miserably every one. Only time will tell but I kind of like this painting. This just proves that I do my best outdoor paintings when I don't overthink the process. I just block in the shapes and let the painting tell me what it wants. The annual Made in Dundas festival at the Dundas Museum and Archives has tons of activities for kids. Everything from a petting zoo to crafts, puppet show, face painting, fire truck and much more. It was very hot and very busy with parents chasing their children from activity to activity. Deb Carson and I were right in the thick of it merrily painting away. The idea was that we would promote our exhibition inside however all the adults were too busy with the activities to chat with us for more than a moment or two. This second painting was an experiment. I had this painting of Moon Bay that I kind of liked but the sky was too blotchy and the water wasn't quite right. Catherine Gibbon suggested that the water could be darker so I decided to glaze over the water to darken it and the sky to smooth it out and lighten it a little. I am now really happy with this painting. I am going back to play with more of my disasters to see if I can work some more magic..
Four exhibitions and a torn medial collateral ligament and torn meniscus and it has been a bit crazy for me. The last of the shows is hung and my knee is improving, albeit very slowly, so I have some time to regroup. I have been very happy with my painting the last couple of weeks. Not much worth posting but I am getting excited about were I am headed. More colour and more contrast makes for much more fun and satisfaction.There are a couple of issues with this painting but none that I can't live with. This painting was done in Courtcliff Park. I painted three paintings Tuesday night and I learned a lot from each of them even though two were pretty bad. This one is 11" X 14" and was painted in about 30 minutes because the sun was getting ready to set behind me. I love the wonderful warm colours in the late evening. I think that this is one of my best acrylic paintings and that excites me. I sprained my knee about six weeks ago and not only is it slowing me down it limits how long I can comfortably stand at my easel. I spent some more time working on my colour study for the commission. I am getting really excited about this now. I am happier with both the rocks and the clouds. Now that the clouds are showing better depth I may fiddle with the mid ground a bit. If I get this one perfect what will happen when I start the larger finished version? No pressure! Last post I introduced my latest commission and posted images of my value sketches. I am reposting the value sketch here. 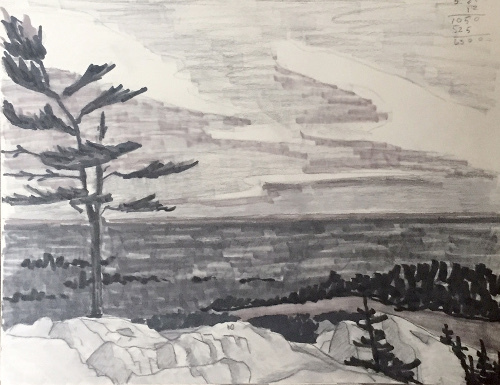 This scene is all about depth and to properly represent the huge expanse stretching to Georgian Bay I need to get the values, colours and shape sizes correct. I have now done a colour study. This is 9" X 12" and the desired finished painting will be 12" X 16" The purpose of this study is to play with shapes and colours keeping in mind the values from the previous study. I need to lighten the foreground rocks to make them believable, lighten the dark midground trees on the right to push them back and the far distant landscape is possibly too light and maybe just little too blue but I can't make that call until I make the other changes. I am starting to think that I can make this composition work. I am working on a commission for a dear friend and paddle partner. I have narrowed it down to two scenes from last Octobers canoe trip. I started with these value studies and would like to thank my very talented nephew Jamie Christie for getting me thinking about using Prismacolor markers. These were fun to do and I will do more preliminary sketches with then in the future. I might even buy some coloured markers. The top left image is one of Bob's photos and top right is my sketch done on location. AY Jackson painted the same scene from almost the same location but that is a story for another time. I painted the sketch while sitting on campsite 30 on OSA Lake and I suspect that Bob took his photograph from the same place. The bottom image is my value study for a painting. This second option is the one that Bob wants me to do. Bob took the photo from the top of The Crack in Killarney Provincial Park. It is a long tough climb for a couple of old guys but oh what a vista. It is an incredibly high La Cloche peak with a relatively flat plain below it stretching to Georgian Bay. It will be tough to show that perspective but well worth a try. 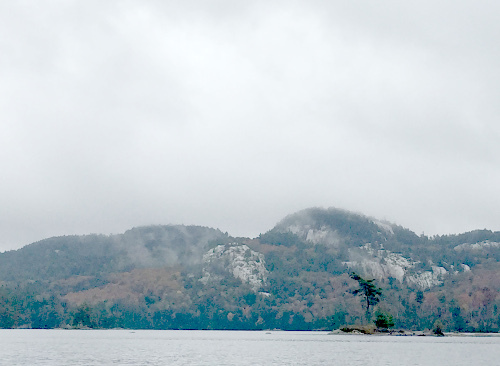 The final image is our paddling crew on "The Crack" looking back towards OSA Lake and more La Cloche mountains. This great bunch of guys drag me along with them and all I have to do is paddle and paint. An outdoor artists dream deal. I had a great time at the Dundas Museum and Archives this afternoon. When I was there yesterday hanging my show I was told that they had invited youth to come paint outside this afternoon. They wanted to know if I could come and set up and paint. I said sure and invited some friends. This was painted quickly and while it isn't one of my best paintings it captures young Max sitting on the stairs of the Doctor's house merrily working on a painting of his grandmother sitting on a bench and totally oblivious to the fact that it was only 3 F. I painted it in a rush because I didn't expect him to stay long but he managed three paintings outside over about an hour and a half. I was impressed because he, like us, worked with no gloves on and my hands were cold and stiff by the time I finished. I wish that I had taken a photo of his painting to show here. His determination reminded my of my grandson Max. 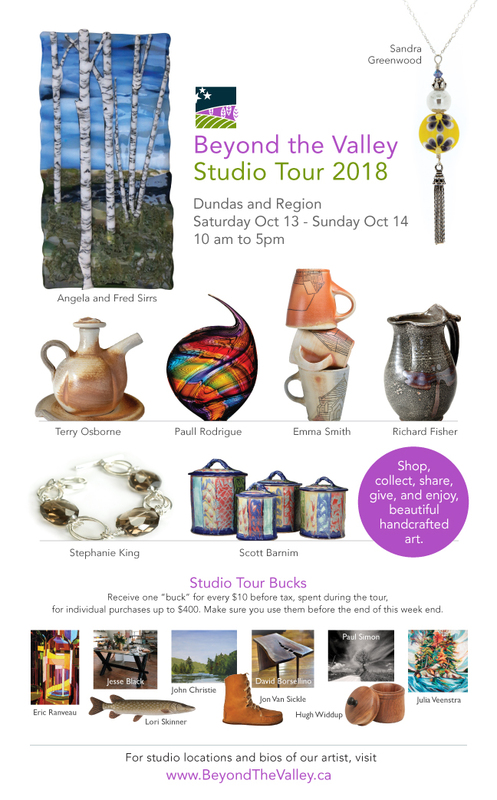 It has been a very busy few months but my solo show consisting of thirty plein air paintings is now hanging in the Dundas Museum and Archives. I decided a little over a year ago that I needed to become proficient with acrylic paint so that I could use them while traveling and especially on canoe trips. I decided this show should be all acrylics and I had no idea how much stress it was going to be. The paintings were all propped up in our living room and depending on the light and my mood they looked fantastic or they looked terrible. Having said that I am really excited about it now that it is up. The lighting in the gallery is far superior to our living room. 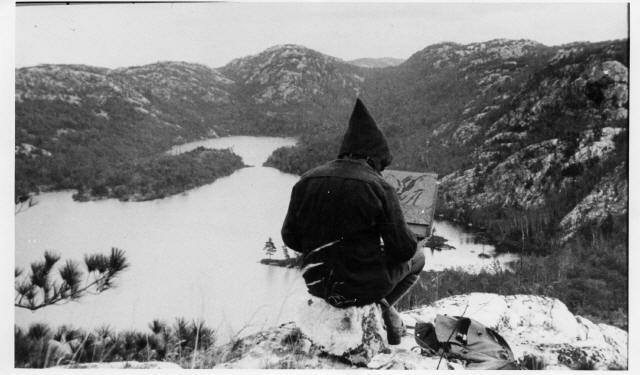 All paintings were painted on location in places like OSA Lake in Killarney or the Tablelands in Newfoundland or Paudash Lake. The gallery is open to the public but be aware that there are often meetings in the room. I am really excited about the opening reception on April 14th from 1:30 to 3:30. I would love to know what you think of my work.